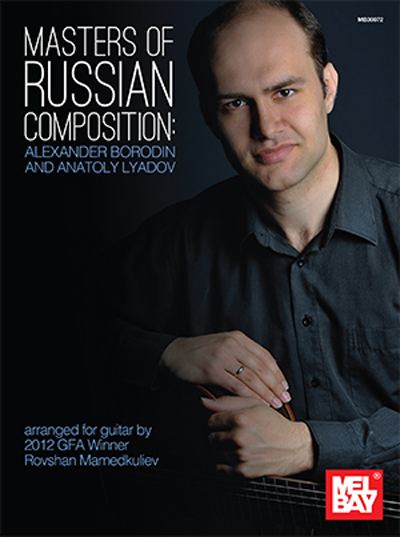 This collection contains arrangements by one of the leading guitarists of the new generation, Rovshan Mamedkuliev.Rovshan invites guitar lovers to explore Russian music of the 19th century. Alexander Borodin (1833 - 1887), member of the famous Mighty Handful, wrote his Petite Suite for the piano. The four pieces presented in this collection barely utilize any of the piano's idiomatic techniques. Though unfamiliar to the guitar until the present day, the selected miniatures are wonderfully suited to its technical and timbral capabilities, especially Serenade. Thanks to the clearly defined genre of Nocturne, the vivid imagery of Reverie and the folk colour and bell-likemelodiousness of In the Cloister, the four pieces, rich in quality and substance, will be a valuable contribution to the guitar repertoire.Anatoly Lyadov (1855 - 1914) used to joke that he could not stand more than five continuous minutes of music. The genius of musical miniature created his compositions to be laconic and refined in form, simple yet elegant. Lyadov's contemporaries called his pieces "tiny pearls of finest finishing" and compared the composer himself to a jeweler. His three preludes from op.36, op.39, and op.40, will become a fulfilling experience for the guitarist as the music explores therich palette of the "mysterious Russian soul", ranging from stormy aspirations to dreamlike, elegiac moods - expressed by the composer in but a few sounds.